Just when you thought you’d seen it all from Randy Couture, the UFC Hall of Famer continues to silence his critics and amaze his faithful. Couture’s latest movie project, “The Expendables,” hit the silver screen this weekend and garnered a cool $35 million domestically to sit atop the box office VIP list. The Lionsgate produced film edged out “Eat Pray Love” ($23.7 million) and “The Other Guys ($18 million) for the Number 1 spot. The movie reportedly opened in 3,270 theaters across the U.S. and boasted a $82 million production budget. In addition to Couture, “The Expendables” features a star-studded cast in Sylvester Stallone, Jason Statham, Jet Li, “Stone Cold” Steve Austin and many others. UFC fighters Antonio Rodrigo Nogueira and twin brother Antonio Rogerio Nogueira also made cameos in the flick. 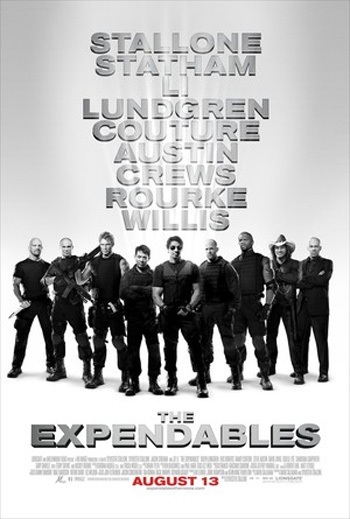 “The Expendables” had received mixed reviews from the critics prior to its debut. However, money talks and and it’s speaking loud and clearly now. So much so that Stallone, who also directed the movie, might follow through with the sequel he’s been hinting about. The movie opening comes just 14 days before Couture resumes his full-time job as a professional mixed martial artist. Instead of infiltrating South America with a group of mercenaries to overthrow a ruthless dictator, “The Natural” will look to welcome boxing legend James Toney into the violent world of MMA. UFC 118 takes August 28th inside TD Garden in Boston, Massachusetts. Couture holds a respectable 18-10 pro record and will be riding a two-fight winning streak into Beantown.